Welcome to our January Mini Blog Hop Number Two. Each month, on the third Thursday of the month, a group of us get together to hop and share projects from Stampin' Up! 's current catalogs. It's always a lot of fun. This is our second hop for the month as we wanted showcase the new Occasions Catalog and the new Sale-A-Bration Catalog. You should be coming to my blog from Lisa Kmiec. After your visit with me, head on over to Jayme Ziemer. And, as always, our Hop runs in a circle. Whether you start at the top and go forward or start at the bottom and go backward, you will always wind up where you started. For this hop, I used two of my newest stamp sets, Beautiful You and Avant Garden. Beautiful You is from the 2017 Occasions Catalog. I think it's going to be a very popular stamp set and one of my favorites. Avant Garden is from Sale-A-Bration. It's one of the free stamp sets you get when you place a $50 order. And, for both projects, I used the new Watercolor Pencils also found in the 2017 Occasions Catalog. For my first card, I used the Beautiful You stamp set which is found in the 2017 Occasions Catalog. I love the images and sentiments in this stamp set. For my colors, I chose are Pacific Point, Rich Razzleberry, Old Olive and Daffodil Delight. All of these colors come in the new Watercolor Pencils set. I can see hours of fun ahead of me. For my second project, I used the Avant Garden stamp set. It's one of the free sets offered during Sale-A-Bration when you place a $50 order. I love this flower image that is in the set. I used the Old Olive and Real Red Watercolor Pencils and blurred outside the lines of the image. 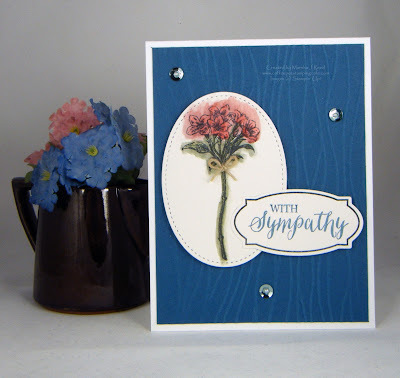 The sentiment I used is from the Rose Wonder stamp set. That is all from me. The next stop on your tour is Jayme Ziemer. To see her wonderful projects, click the image below. If you'd like to revisit Lisa Kmiec and see her great projects again, click the image below. To start at the beginning you can click the image below to go back to the Wacky Watercooler Stamping Blog. Thanks, Sheri! Those watercolor pencils are going to be a lot of fun to use. I'm still learning about the aspects of water-coloring and these will be great to use in the process. 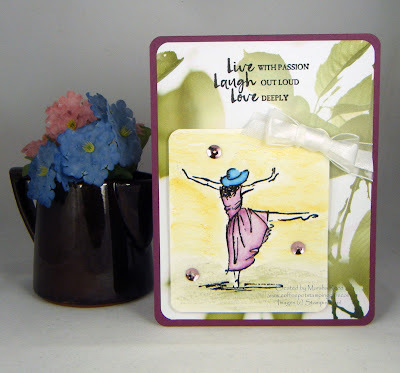 Absolutely beautifully coloured cards, Marsha! Both cards give such a soft, comforting feeling. Beautiful cards Marsha! I love your watercoloring! Thanks, Lisa! I'm still a novice at watercoloring but it's something I've found I really enjoy. Great stamp choices for both your projects Marsha. I'm in love with the Beautiful you sentiments and images and yours looks so wonderful against the DSP background. Your second card really is coloured and laid out so nice, that I think it's my favourite. I can't wait to get my Avante Gard set. Thanks for inspiring. Thanks, Penny! Avant Garden was the first set I saw that I knew I had to have. Marsha, you're really coming into your own with the watercolouring. Funny how you used to shy away from it and now it's one of your specialties. Beautiful choice of DSP for your background---makes that gorgeous dancing lady look even more special. I think you've sold me on the Avant Gardens set, too. The image looks so much better than I thought it could. Of course, some of that's due to your terrific job of colouring. Thanks, Heidi! These days I seem to be incorporating more and more watercoloring in my projects. The class I took last October at Stamp Joy was a big help and I learned much. Wow, love your watercoloring, very nicely done! Yes, I agree with you these two stamp sets are very popular. The colors you chose for each card is perfect. Thanks, Heather! Watercoloring is fast becoming my favorite thing to do. Marsha, love your cards. I finally used the Beautiful You set today and love it too! Love the way you water colored the image. The Avant Garden is wonderful. I never thought of blurring outside the lines - thanks for the tip! Thanks, Marie! Watercoloring is fun and these two sets just beg to watercolored. Wonderful cards Miss Marsha and bless you for helming the hop yet again. I love how easy it is to color the Beautiful You images and love all the sentiments. Especially the sentiment you used. Cool technique you used too on the Avant Garden card. More additions to the CASE list! Thanks, Jean! Both stamp sets are ones I'll keep long after they retire. Beautiful You is one of my favs, and your card is lovely. As is Avant Garden--I like the soft coloring and the bright Seaside embossing folder. Such a pretty combination. Thanks, Priscilla! They were both fun cards to make.